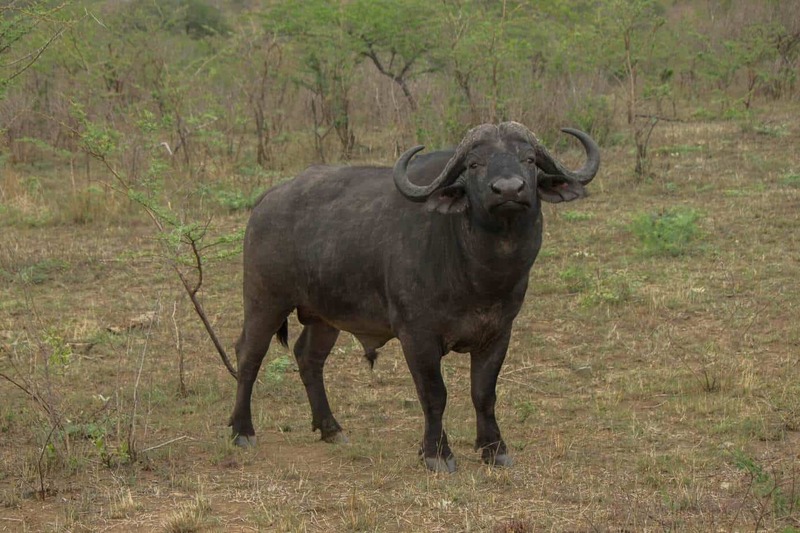 The African buffalo (Syncerus caffer) is the largest bovine in Africa. It is only distantly related to other large bovines found on other continents. Males are larger than females and shoulder heights can reach 1.7 m (5.6 ft), with weights up to 900 kg (2,000 lb). 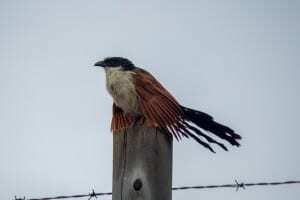 It has a long stocky body with shorter legs than some of its relatives. 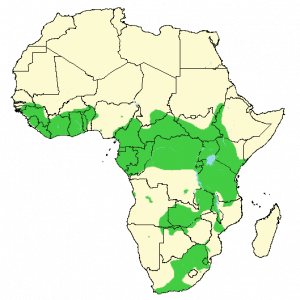 There are two distinct forms on the African continent, both quite different in appearance. The common savannah subspecies, the Cape buffalo (S. c. caffer), is the largest, with big powerful horns and a dark grey to brownish coat. The forest subspecies (S. c. nanus) is much smaller, weighing up to 320 kg (705 lb), with smaller horns and a reddish-brown coat. 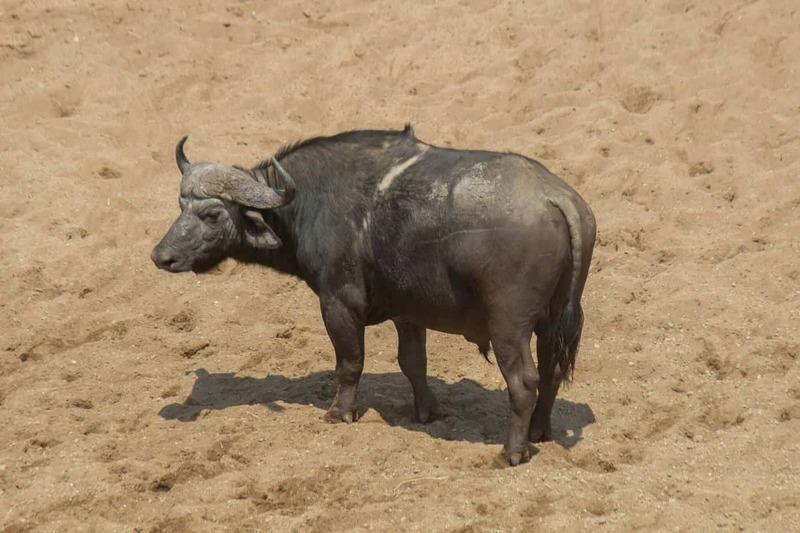 The forest buffalo is only found in the tropical rainforests of central and western Africa. 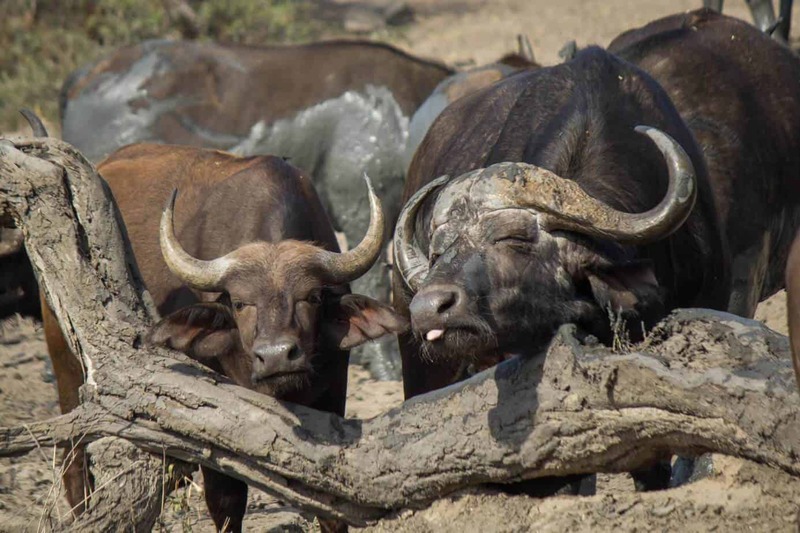 This article focuses mainly on the more common Cape buffalo. 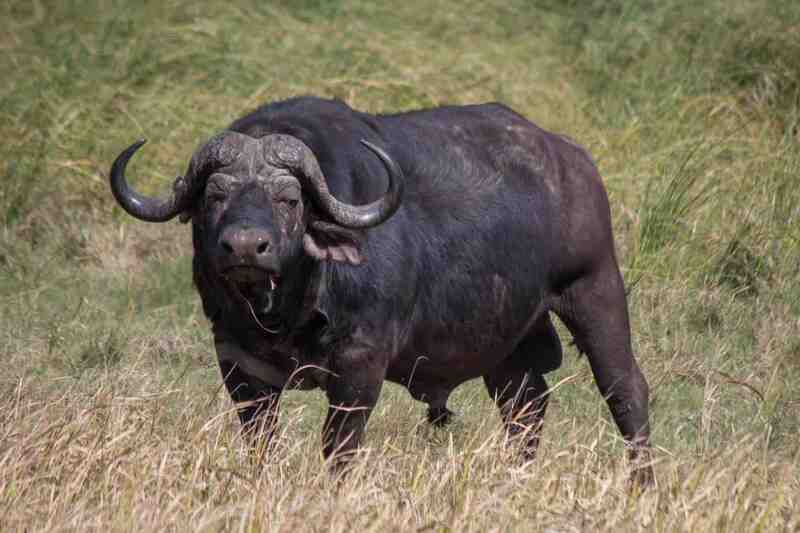 African buffaloes are grazers and prefer habitats with dense cover and constant access to water. 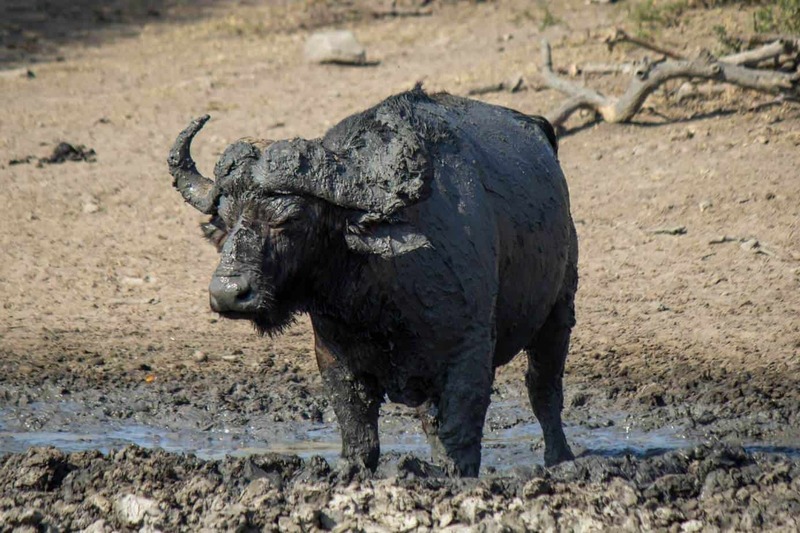 It is common to find buffaloes in swamps and floodplains, often in the cover of tall reeds. 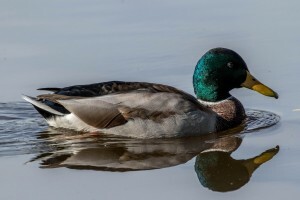 As long as water can be reached on a daily basis it is not constrained by habitat and can also be found in open grasslands and woodlands. 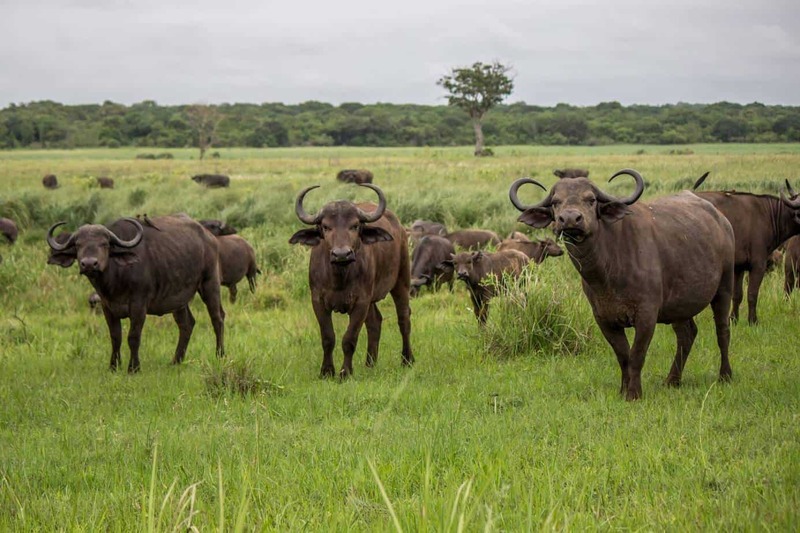 Most African buffaloes live in herds, and sometimes a herd can reach a number of up to 1,000 individuals. Herds are composed of a hierarchical society of related females, with various smaller herds of subordinate males, high-ranking males and females, and older and injured individuals in the periphery. Dominant bulls are generally avoided by the other bulls in the herd. 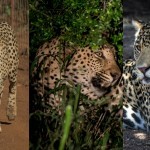 In the dry season, males will split from the main herd to form bachelor herds. Two forms of bachelor herds are formed, those with males aged 4-7, and those with old bulls aged 12 or more. 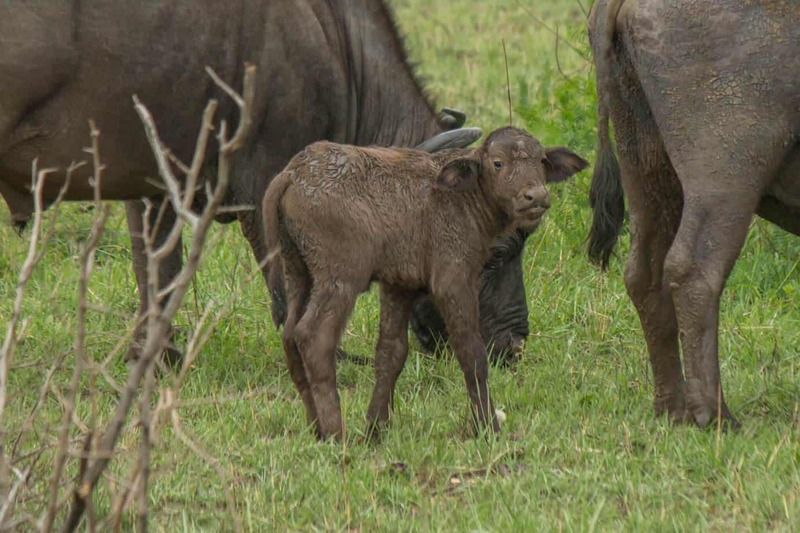 The bulls aged 4-7 will rejoin the herd in the early wet season, when females give birth to calves conceived the previous year after a gestation period of over 11 months. A few weeks after calving the mating season begins. Dominant bulls will spend this period close to possible mates and will try to fend off competition. Bulls stay with the herd after the mating season to protect the new-born until the next dry season, at which point they again split off into bachelor herds. Bulls too old to compete with the younger and more aggressive bulls will never rejoin the herd and will live the rest of their lives either alone, in pairs or in small groups. Buffaloes feel more protected when residing inside the herd, and the herd will come to the rescue if any single individual is in trouble. During a predator attack, buffaloes normally stand their ground and will try fight back. Because of this the big herds are generally safer to approach on foot because they know they have the advantage in numbers if anything should happen. It is generally the older solitary bulls that are the most dangerous. 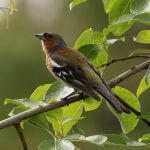 They have no protection but themselves, and possibly a companion or two, and are therefore more likely to attack anything they perceive as a threat. 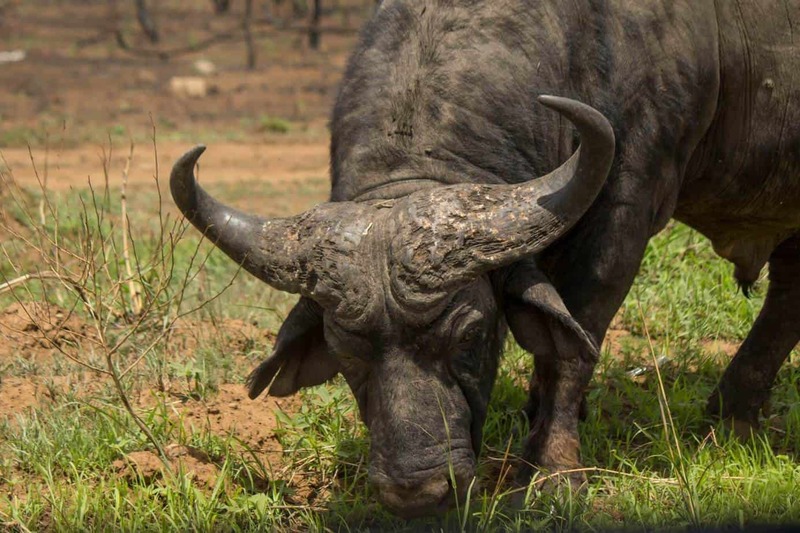 These bulls, often called “dagga boys” in South Africa, are responsible for killing almost 200 people a year. 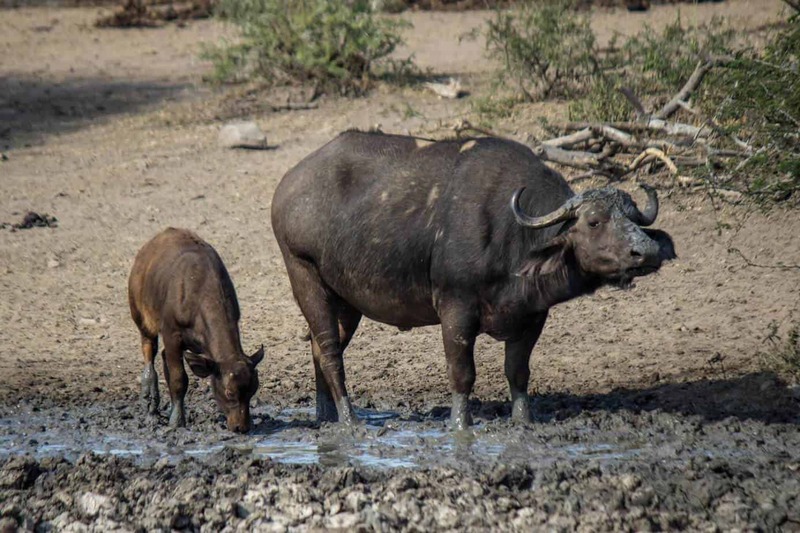 There are few animals that regularly prey on buffalo, and lions are the only animal to commonly hunt them, with crocodiles also catching and killing buffalo from time to time. 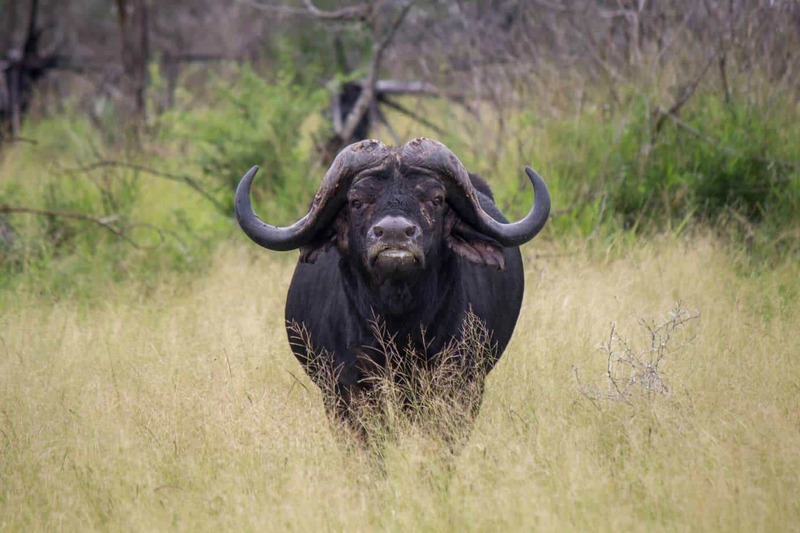 The Cape buffalo is highly aggressive and unpredictable and will defend itself and its young viciously. They are known to follow the scent of lions and will try to kill both cubs and adults as a way of self-preservation. Buffaloes do also occasionally follow humans, and if walking in areas with buffaloes it is important to stay vigilant as they often attack without warning. They very rarely attack vehicles, however. 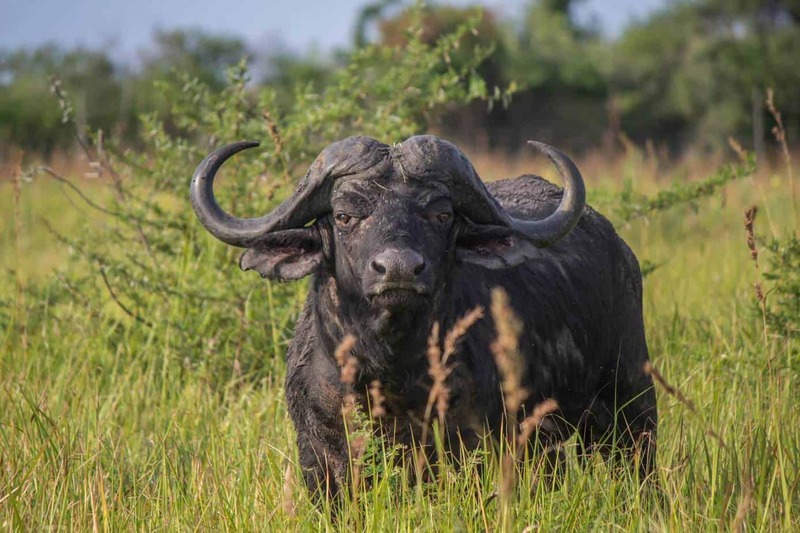 The African buffalo is listed as least concern on the IUCN Red List, and is not in any immediate danger. 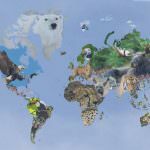 Large populations persist in numerous protected areas, and the population is more or less stable. The only dangers to buffalo from man is trophy hunting and poaching, though neither is frequent enough to cause any impact. They are prone to get diseases, such as bovine tuberculosis, and large portions of populations have been wiped out because of this before. 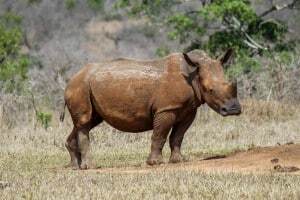 Clean populations are rare, and one disease-free individual can be sold for as much as $130,000, making it one of the most expensive animals on the African game market. Diseases will stay dormant in a population as long as the general health is good, and thus there is no immediate threat of an outbreak in stable populations.